Today we would like to share with you one of our personal favorite Halloween decorations. The Wacky Witch at Cauldron Lighted Halloween Decoration is as spooky as spooky gets. The lighting detail on the lighted witches cauldron is absolutely phenomenal. This is one decoration that is sure to impress the neighbors. 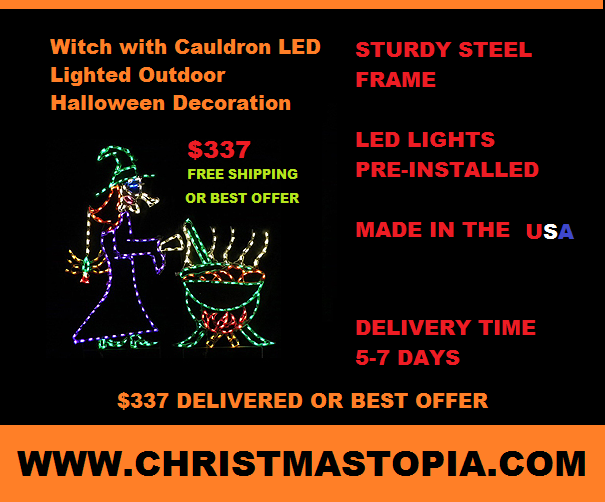 The lighted witch has so many applications that it will put your creativity in overdrive. We’re not kidding! Use it in your yard or in another place befitting outside your home. You can hang it on your railing or off your deck. Scare up your house, garage as well as indoors as part of a visual merchandising retail presentations. The bulbs never get warm to the touch so they are ideal for indoor use. If you act now, you can have the set ‎delivered right to your door for $337 or best offer. Don’t let the price scare you because that’s the witches job. All our lighted Halloween decorations are hand made using powder coated white steel and pre-installed with LED lights. Each LED light bulb is meticulously pre-installed on the steel frame. All you do is take it out of the box and plug it in. Instant Halloween display. So remember if you order the Witch w/ Cauldron right now, you will get 10% off plus FREE SHIPPING inside the continental US. Most orders ship out in less than 5 days. Our lighted decorations are proudly made in the USA.